Procrastinating a few weeks ago on the daunting revisions my current WIP (work in progress) required, I opened Randy Susan Meyers’ newsletter to find a list of recommended writing books (Randy was also in revision mode). 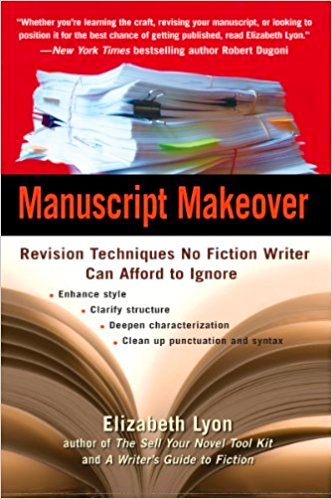 Most of them I’d read, but I’d never heard of Manuscript Makeover, by Elizabeth Lyon. Divided into sections about voice, style, characterization, and even marketing, each chapter starts with a quick “options” section that explains what’s in it, and why (depending on what specific problems we are trying to solve) we should either read it or skip on to the next. Lyon describes manuscript issues in a non-judgmental and mostly generic way that make it easy to apply to my own quirks. A perfect example is her three-word command: “Make it worse.” I tend to solve my character’s problems too soon, before the rising tension has a chance to show a character’s weakness (and then spur the growth that follows). Instead, she says, I need to ratchet up the stakes: that ocean the character has to cross should become wider or colder or stormier—not all at once, but through a series of increasing challenges; a single wave crashing over the bow leads to a small gale, which causes the hero to run out of food or the mast to fall over the side (or both). Another helpful section discussed the advantages and disadvantages of telling a story from several different viewpoints. Though there is a main character, the book I’m revising changes perspectives in order to show pieces of the story that happen when he’s not present. “Multiple viewpoint stories have more scope,” Lyon agrees, but she also points out that each viewpoint character must have a problem that’s solved, or at least progressed, by the book’s final page. The required balancing act does make the writing (and revision) much more complicated. I’m not sure I’ll ever have the energy for this type of writing again, but it’s the only way to tell this particular story. Manuscript Makeover may be the most important book I read in 2017. (Thanks Randy! To see how well she made use of this book, read her novels.) Since finishing it, I’ve developed several new revision techniques that are helping me on the slow slog from first draft to best book possible. The only thing I found distracting was the occasional examples Lyon used, which didn’t always illustrate her point for me as efficiently as her own explanation. 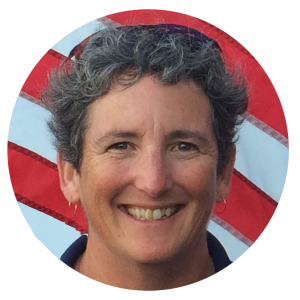 Carol Newman Cronin is an award-winning writer/editor and an Olympian. Click photo for more. Adjectives: Lazy Shorthand or Powerhouse? Copyright © 2019 Carol Newman Cronin. All Rights Reserved. Enjoy this blog? Please share and subscribe.